On My Plate: Burger King’s New Big King XL - Has The Clone Surpassed The Original? Burger King’s New Big King XL - Has The Clone Surpassed The Original? I haven't written here since November. I’d like to be able to blame my holiday schedule, and yes, writing all those Christmas cards does take time. The truth is though, I just wasn’t feeling it. With our country in turmoil, I felt like there were more important things to write about. Fear not. I am an eater at heart, and my appetite has dragged me back to the land of epicurean opinion. I just ate two all beef patties, special sauce, lettuce, cheese, pickles, onions on a sesame seed bun. No, I didn’t go to McDonald’s. 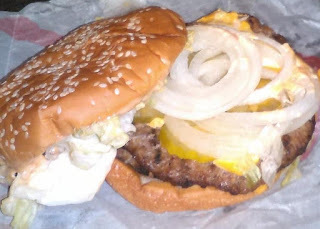 I went to Burger King (18975 SW Tualatin Valley Hwy, Aloha, OR 97006) for their new, Big Mac inspired, Big King XL. My assistant, Dani, arrived at BK just as breakfast service was ending at 11am. She asked for their XL Burger. The cashier told her they didn’t have that, thought for a moment and said they have the Big King XL. OK, being specific is a good thing. A few years ago Jack In The Box marketed their Big Mac clone, the Bonus Jack, Now BK is jumping onto the bandwagon. It's a heavy burger, an the flame broiled beef patties were noticeably larger than any burger patty I ever got from McDonald’s. The onions were sliced instead of chopped, the iceberg lettuce was torn instead of shredded, and there's no center bun, but all the flavors associated with their competitor’s flagship sandwich are there. The onions, dill pickles, American Cheese, and sweet, Thousand Island style, sauce work together to sing their familiar tune. What sets this burger apart is the flame broiled beef. I’ve never felt I could taste the meat in a Big Mac, it was just… kinda… there, and the flavor came from the toppings. Here though, the meat was protruding from the bun, on all sides. Plus, the grill marks gave flavor to the beef itself. My only qualm was the price. The burger alone was $6.70, and the combo (fries and a drink) is just shy of $10.00. When McDonald’s offers two signature menu items (Big Mac, Filet-O-Fish, 10 pc. Chicken McNuggets, or Classic Chicken Sandwich) for $5.00, it makes no sense to have the copy cost more than two of what they're copying. Yes, it’s a better tasting sandwich, and a bit more filling, but it’s not better tasting enough to justify the price point. All things considered, I give Burger King’s new Big King XL 8 out of 10 stars. Only the price kept it from being a 10 out of 10.